What is an "Object" Lesson? Teachers use object lessons all the time, and we've seen and heard the term, but what is an object lesson and why is it so important to use them often and well? 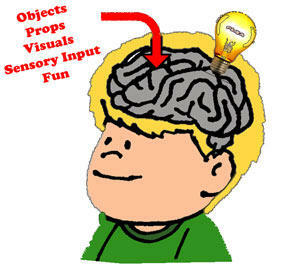 Object Lessons are concepts (a) illustrated with objects (b). Example: "A is like B." The objects help describe the concept or idea. The object become "metaphors" for the concept or idea. This bread is (like) my body, broken for you. Jesus didn't just talk about the bread, he held up the object, broke it, and passed it around so we could taste it. Yes, The Last Supper and Communion is an object lesson! Aside: Purists are welcome to differentiate between "metaphors" and "similes" but they are functionally the same thing. A simile is a metaphor with the word "like" added to make the metaphor more obvious. With an object: Faith is like THIS plant I have here. See me plant it in good soil, give it sun, water and feed it. How is church like this soil you're sticking your fingers in? Here, help me water it now. How is scripture like this water. etc etc. Objects don't always have to be "things," they can be tastes or emotions, for example. The educational theory of "Multiple Intelligences" adds to our understanding of what an "object" is. Because our brains have many ways to learn, and not just by seeing or hearing, an "object" can be a song, a taste, an animation, a movement, sounds, or a drama. Creative teaching methods understand that ideas need hooks, because that's how the brain is built. It needs objects to focus attention, store info, and remember. In a very real sense, each of the workshops in the Rotation Model reminds you to use different types of "object" (media) in your lessons, and to make sure a variety does get used. Without setting up these specific workshops to emphasize different techniques, we know that volunteers will tend to fall back on the same approach every week, –talking an awful lot, and then allegedly breaking up the boredom with worksheets and crafts. Thus in Rotation, the Art workshop focuses on creative object manipulation. The Drama workshop has the students themselve becoming the objects (actors), and using props. The Cooking workshop turns the preparation and tasting of food into tasty metaphors. The Science and Storytelling workshops are "stories that have object and prop filled demonstrations." The Game workshop is full of game props which can have meanings assigned to them. The Computer workshop gives the students objects to observe and manipulate on screen, and so on. I guess what we're saying most here is, "the object in your object lesson should not be the sight of your lips talking to bored children." Jesus used objects all the time in his teaching. "When ever you eat this bread, do this in remembrance of me." For the purposes of teaching children, we might add the word "like" to his quote in order to explain the metaphor Jesus was using. He wasn't saying he was an actual road in the dirt, he was saying, "I Am Like a Road, the Only Road." Jesus is not asphalt. He is the only way to fully know God. To explain the metaphor in visual and object terms, I might make a bunch of road, or have a scooter, add obstacles and things that want to knock us off the road, and other roads to don't go anywhere. it would also be important to illustrate that Jesus is the only road that takes us where we want to go: to full communion with God. Theological nitpicking aside, you get the idea of how you might need to carefully construct your metaphor so that it is not misleading. So if you're teaching that in a classroom or children's sermon and want to restore the object power Jesus was tapping into that day on the hillside, you could have a bird puppet or real bird to show the kids. Why? Because like Jesus knew, the object serves as a focal point, and memory trigger. Jesus knew that the next time the people contemplated birds flying around, they might remember his teaching. Smart guy. When is a rock still just a rock to a child? The problem with objects and metaphors in our lessons is that, developmentally speaking, young children have a difficult time understanding metaphors. "God is like a rock" can mean "God is hard, round, and hurts when thrown." According to educational theorists, such as Piaget, young children go through stages of cognitive development. A first grader is said to be in the "concrete" stage where to them a "rock is a rock" and not a metaphor for God's strength or our faith's strength. Most children will naturally develop the capacity to grasp metaphors, but they must also be taught how to make the leap from concrete to metaphor. Teaching them how to make this leap is especially important for spiritual development, for ours is a metaphor-rich faith. Some parents don't encourage that kind of "deep" thinking. And some teachers only teach information, rather than transformationally. Imagine teaching the memory verse "consider the lillies of the field," without teaching them HOW to consider what Jesus is getting at? Imagine teaching them how to to "take and eat, this is my body broken for you," without teaching them why Jesus' was broken, and how that brokenness turned into healing. I see pastors fumble the Object Lesson "Ball" all the time in Children's Sermons. The mistake: They choose objects that require too much of a metaphorical leap for the average age of students seated on the chancel steps (which tends to be very young in most churches). Our pastor recently showed a broken mirror to children and said, "You are like this broken mirror. You are supposed to reflect the image of God, but your sin has broken your mirror." To which a child concretely and erroneously asked, "how did that mirror get broken?" Everybody laughed, but the pastor's point was lost over that child's head. The problem was that he had three metaphors going on with one object: we are like a mirror, we are broken (which was supposed to be the main point), we can't reflect God's glory. And he never explained the challenging concept of "what does it mean to reflect God's glory" or "how can God restore the mirror." See this picture of us? I took it last week, remember? Sin, our bad choices and bad attitudes, tear us apart (give examples of sins, then say) It tears apart friendships and churches and families. (tear up the picture as you say these things). Do you think that's what God wants for us? No, God wants to restore and repair us. And forgiveness is the way God makes us whole. Forgiveness is like God's mending tape. On the cross, God forgives our sins (put a piece of tape on each student), and now we are to use that gift of forgiveness to turn around and mend what's wrong or broken in our lives. Will you help me restore this picture? (hand out the picture pieces, have them assemble it, then use their tape to mend it. Conclude by saying, "and there's no problem so big or so bad that applying God's forgiveness can't mend, ---then walk around all your students with the tape reeling out of the dispense, taping them all together. If you run out, pull another tape dispenser and keep going! The photo and scotch tape are the simple understandable everyday objects in the lesson. The final fun wrapping of the tape around all the kids is the super-memorable object-visual (with an emotional memory attached!) that will help everyone think about forgiveness the next time they are using scotch tape. A better metaphor object for "reflecting God's glory to others" would have been the simpler and more fun idea of wrapping a student in tin foil, and then having the other students shine flashlight on him to light him up. I would have then asked the kids what things does God want us to reflect or "give" to others (love, forgiveness, help) and written those on cards and taped them to our foil-wrapped student. The visual and simpler metaphors work better, especially for younger students, and are more FUN (and "fun" is a great memory hook). "Broken mirror" is just too high concept as the young boy pointed out. BTW: Objects don't have to be metaphors, they can simply be great storytelling props. A rock can just be a rock. Having a shepherd's crook in hand while you talk about the Good Shepherd gives students a better visual hook (pun!) than looking at your lips form the words. Puppets are props, not metaphors. They are simply funny to look at, and that focuses the mind on what they say. I've done children's sermons using Barbie dolls and footballs, where the doll was a puppet that I spoke through, and the football was simply a prop in the story of the boy I was telling. Kids love that stuff. This is the secret behind all great teaching: creating visuals, and not just with your words, but your movements, props, foods, pictures, games, etc. ...and with children, getting them on their feet and into the story too. Worst way to learn is to watch someone else's lips move. Use objects/props whenever you can. Make sure the objects clearly illustrate the metaphor. Make all your objects hands on, fun, and thus, memorable. I hope this brief article helps your teaching. Neil MacQueen is a Presbyterian minister who has been working with children and youth for several decades and helped create the Rotation.org website. Read his article: "7 Tips for Better Children's Sermons"